That previously unpublished photo sequence was taken by me at the Kalachakra tantric empowerment in Ladakh in the disputed Indian region of Jammu and Kashmir. In the first photo the Dalai Lama is delivering his teaching from the dais. There is then a disturbance close to the platform - photo 2 - and His Holiness rises from his seat looking somewhat bemused, although his head of security on the extreme right looks rather more concerned. An oracle has entered into a violent trance and is trying to approach the dais. The wayward oracle is restrained - photo 3 - and then unceremoniously carted away - photo 4 - while the overturned floral decorations are sorted in the background. In the final photo the unruffled Dalai Lama is returning to the dais to continue the empowerment*. 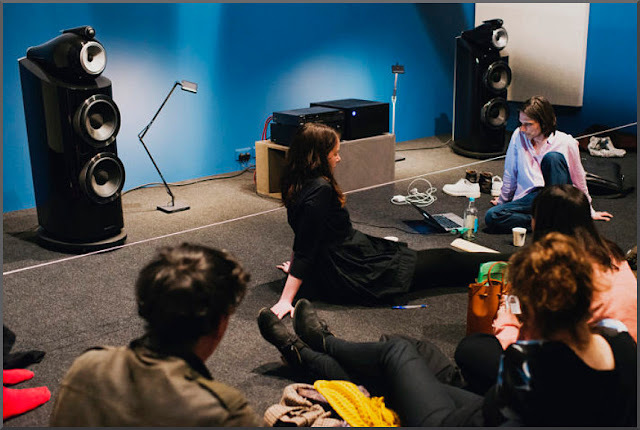 Sharing these photos from 2014 was prompted by the arrival of a promotional piece from high-end speaker brand Bowers & Wilkins titled Sound Therapy #1: Does Music Relieve Stress? This is dotted with cool references including Spotify's Ambient Chill and Chill Lo-fi Study Beats, and Max Richter's nine hour Sleep - see footer photo to get a feel for the tone of the article. Max Richter's hymn to sleepwalking was given a heavily-spun airing by BBC Radio 3 in 2015, and since than Radio 3 has jumped on the 'slow radio' bandwagon - "immerse yourself: it’s time to go slow" - and is trying unsuccessfully to staunch its audience hemorrhage by also jumping on the playlist bandwagon. This blog has been an active advocate of sound therapy. But it is a fundamental mistake to bracket sound therapy and sleep-inducement together. In his translation of The Tibetan Book of the Dead Robert Thurman explains that trance is the experience between dualistic consciousness and enlightened awareness. The unique power of great music is to transport the listener fleetingly from the world of quotidian triviality to an intermediate state - bardo - between consciousness and laser-like awareness. Meditation and relaxation have a role to play in trance; but the destination is heightened awareness, not soporific sleep. Achieving awareness is not always a comfortable experience, as the oracle in Ladakh found out. But study the Dalai Lama's face in my photos: he is engaged, but not disturbed. Because he understands that the journey to higher states of awareness does not respect comfort zones. My photo sequence is a powerful study of how Tibetan Buddhism with its tantric rituals can be a walk on the wild side, as can the trance lila of the Moroccan Gnawa. Lama Yeshe taught that Buddhism is not a philosophy or religion but a study of your own mind; and there be dragons. Ambient Chill playlists and the other heavy baggage of the slow music movement kills those dragons. And slaying them also kills the very raison d'être of great music. * Photos were taken on my venerable Canon SX150 compact digital camera. This is favoured because it is small and uses easily-obtainable AA batteries. But I did have the privilege of a press pass at the Kalachakra empowerement, which allowed me to get unusually close to the Dalai Lama. My thanks go to the Tashi Lhunpo UK Monastery Trust which arranged my press credentials. Any copyrighted material is included for critical analysis, and will be removed at the request of copyright owner(s). Also on Facebook and Twitter.